I hope everyone had a great Christmas Day with all their families and friends. To continue the Christmas season I still have one more Christmas post. (I have to draw this out any way I can). Well, there are 12 days of Christmas right? 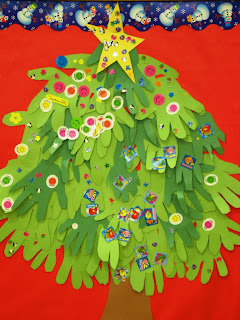 The picture at the top is of our December interactive bulletin board from this year. Our class finished up last Thursday with a GREAT class. It was a wonderful day. Many times this last class is just chaotic. The children are excited, we're trying to make sure everything is ready to go home before break, and also, I'm hoping they are ready for their show. This class was just heaven. (I think I learned my lesson from Tuesday). I told Mrs. T I wasn't doing anything formal. I was going to introduce some things and let them decide and that is just what I did. 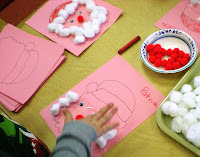 I again had two crafts, but they were two crafts the children could do totally on their own, and only if they wanted to. 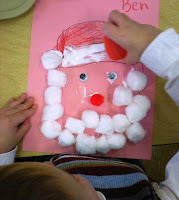 First, I had a Santa Claus they could finish. 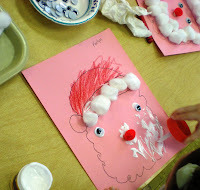 It was just a paper with Santa's outline and the children glued on cotton, google eyes, and a red pom pom for a nose. 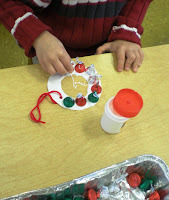 The other craft was a great one I found over at Creative and Curious Kids this year. I really liked it and was hoping to be able to use it this year, and I DID. (Any baby yet Jen?) 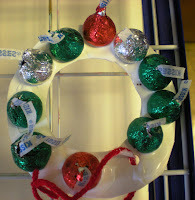 The craft is a Christmas ornament made with Hershey Kisses. On the table I had cut wreath shapes from paper plates and put a string on them. 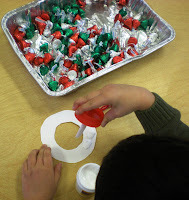 The children glued on the Hershey Kisses. 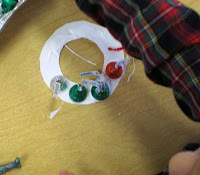 I will say we used LOTS, and LOTS, and LOTS of glue. 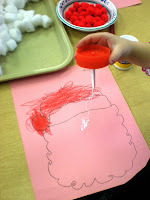 I'm pretty sure these crafts went home still dripping with glue. You know the funny thing? 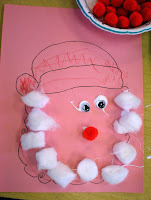 Almost every child in both classes, did both crafts and we weren't behind time or rushed for anything. How did that happen? 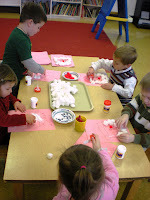 It was so cute too, the morning class had a great time with the puppet area. They all took turns putting on a little puppet show while their friends watched. They played here for quite a while. We finished up at 10:45, the children had their snack, family arrived, and they put on a wonderful performance for everyone. It was a wonderful day! I hope all the families had a nice day and and wonderful Christmas break. We'll see you all in 2010. These are all great, but I particularly like that bulletin board. Thanks for posting it! Awesome post! 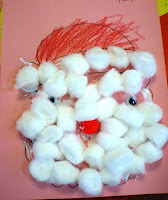 Loved the Santa Claus activity!